Since our 12 month old has been on whole milk and no formula, he has been having painful bowel movements irregularly. He usually has at least two movements a day and they aren't painful for him. Now, the consistency of his bowel movements resembles play-dough though he will have normal looking movements in between these. We have cut back on starchy foods and given him orange and apple juice to try to relieve the hardness of the movements with no luck. Is this something that you have found common when babies first transition to whole milk or should we bring him to our doctor to diagnose the cause of the constipation/painful movements? Are there other things we can try that you have found to work better than juice? Children often get constipated when starting whole milk. 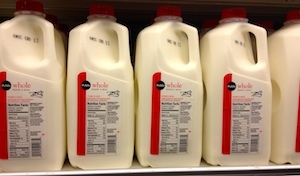 In practice, I often find many of these children are drinking too much whole milk. In contrast to formula during the first year of life, cow’s milk should only be a small portion of a 12 month old’s diet. Most of my cow’s milk constipated 12 month old are drinking in excess of 30 ounces each day. One year olds only need 10 to 12 ounces of whole milk a day. When addressing constipation issues it is always best to start with dietary changes, prior to initiating medications. Decrease his current milk intake. If he really is drinking 30 ounces of milk a day, reduced him to the appropriate 10 to 12 ounces. If he is only drinking a modest amount of milk you may need to stop all milk for a couple weeks. Increase his water, fruit and fiber intake. Juice helps with constipation, but is not a good long term solution. After his stools soften, try to slowly reintroduce the cow’s milk. If diet doesn’t fix his issues it is best to have him evaluated by his pediatrician.